We probably broke our record of how long we took to decide what to do with the “Beneath the Surface” theme. We scribbled 20 subjects on our whiteboard while we discussed. Of all the ideas, I recall two the most: one where the Devil would manipulate events on the surface to make people sin and get pulled to hell, and another one that had a lifeform, on an operation table or petri dish under a microscope, defending itself against probes that would penetrate its shell or shield. The Devil idea was giving us some trouble, we weren’t sure how it would play or what type of events were at the player’s disposal, but without the time pressure we might return to it someday. The lifeform idea had us debating more about simplicity and presentation, a sign that we were on the right path. The original vision had the player choose between four sides of the lifeform, where energy could be increased to expel the probes, or decreased to be used on the other sides. It reminded me of managing your shields in Star Trek Online’s space battles. But I guess that vision went to hell when I drew this dumb thing with moles from outer space, flying drills straight into a planet. So vibrant! It was like everything clicked for our artist from the very start. We quickly had a very visually appealing style that kept us motivated throughout. It would be enough to inspire the remote rest of the team, we hoped, and we were right! I tasked myself with doing the sound effects for the game but our musician unexpectedly started delivering on those very early. Only in the afternoon of the last day, when we were one team member fewer and getting tired, was when we got a sample of the song, and we went nuts! It was perfect and stayed on repeat for nearly an hour or so. Technical problems on our end kept our other artist from helping out more, but she whipped out the best game logo we could ever wish for. We are getting better and better at polishing our games. And I don’t mean having all the bells and whistles to catch someone’s attention, but in giving proper feedback to the player. We put flashes and screen shakes to good use, for landing a hit on the enemies and getting damaged, and the moon loses opacity after a dash, bouncing back when it’s ready to be used again. 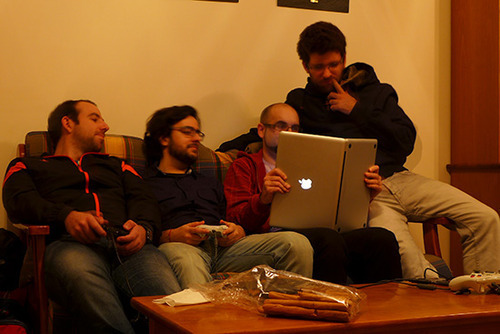 During a game jam, polish is usually put aside due to the time constraints, but by participating more in these competitions, you start to get a feel for how long an idea will take to be made and you can start saving some time to concentrate on the visual feedback of the core mechanics. Four team members together and two off-site, we could handle this, we just needed to progress a bit further with our work so that the other two could base their work on ours. We even had a second musician interested in our project, but technical difficulties of his own kept him from joining. Our technical problems weren’t that far off though, suddenly our shared mobile internet stopped working. Our connection went from 30 Mbps to a whooping 128 Kbps and Skype wouldn’t even log in. There goes using Git and Dropbox out the window. We had hit an invisible traffic limit and there was no way to pay to increase that limit, we could share our credit card numbers with the provider’s customer support staff all we wanted, they wouldn’t budge. Two of us could share mobile internet from our phones, but it had to be done in a hit and run manner so we wouldn’t spend too much traffic. We could no longer have those Skype calls with screen sharing with our remote artist that we had in mind. Later that night, we fared goodbye to one of our programmers. He had work in the morning and couldn’t stay with us any further. The remaining three of us then decided that in the next morning we would drive to the artist’s home so we could resume our work with some proper internet, which unfortunately shaved off around 2 hours of possible progress, but we endured. Prior to the jam, I toyed around with the 1.3 beta of Game Maker Studio and found out that some of my code had stopped working. Further inspection pointed out that the change in variable scope was the cause. Granted, I’m not a programmer so my code is faulty 99% of the time, which causes anything I compile to crash or freeze or both. The problem is that crashes aren’t as graceful with GMS 1.3 as they were with the previous stable versions, and some of the times the actual software – not the game – would also freeze and crash. I warned the team about this, but there was one new feature that we coveted: having proper pixelated rotations. We could achieve this by disabling interpolation between colors and resizing the application surface, but 1.3 makes it so much easier to set up surfaces that we bit the bullet and took some time to get used to the changes. We also had a running joke/issue with the planet’s rotation. Drills would target a slice of the planet and miss it, but they would think they were on the targeted slice and not the adjacent one. The only way to destroy them would be attack the slice they missed. This took forever to solve, but somehow the ghost of that semi-invincible space drill return to haunt us, in the shape of an actual invincible drill that randomly appears during the game. We’re still scratching our heads with that. Lastly, it was also somewhat challenging to port the game to HTML5. Performance isn’t great and we still haven’t had the opportunity to fix the bugs that aren’t found only in that version. Too much is missing. Remember earlier when I wrote that we couldn’t be too ambitious? I was wrong, being ambitious is what drives an idea, you just need to keep a list of things you might not accomplish and then cut them when the time comes. The moles were spared this time, since we decided to not implement the damage they would cause to the surface of the planet, we also didn’t add their reactions to the elemental attacks. Though we should have added a default death to avoid slowdowns when there are too many moles on screen, which is noticeable on the HTML5 version. The biggest feature that was left on the cutting floor was the Elemental Combo Attacks. Players would gradually unlock these stronger attacks by destroying the invaders and collecting Experience Orbs. There are three circular slots at the bottom right corner of the screen, two of which are locked. Unlocking them would allow Elemental Attacks to be quickly cued up, creating a combination of two or three elements. Besides unleashing a powerful attack against the incoming waves of stronger enemies, it would also terraform the surface of the planet, creating harsh environments to fight against moles that would come prepared for a different type of climate. After so long, this game jam exceeded my expectations, it was another great experience. I still feel a bit rusty, I mean, I haven’t put much thought on how to balance the game, but that might be because I’m now looking at the current version of the game and forgetting some of the cut features, like some of the drills crash landing instead of going towards the core (I just remembered this!). There was a great team chemistry and constant communication, to my knowledge there wasn’t one problem that we weren’t all on it and attempting to solve together. And taking into consideration the time wasted fixing issues outside of the jam itself, or relaxing with some TowerFall, we were able to exceed our standards from our previous entries. Weirdly enough, this is the second game about planets that we made, where the player can interpret some kind of underlying message about colonization or nature. We are on the path to becoming true planeteers! You can play “Orbital Burrow” at Ludum Dare or at http://makeaga.me/orbitalburrow/. I recommend that you download and play the Windows version if you are able to. This entry was posted on Sunday, May 18th, 2014 at 2:21 pm	and is filed under LD #29. You can follow any responses to this entry through the RSS 2.0 feed. You can skip to the end and leave a response. Pinging is currently not allowed.